In the 1896 Memorial History of Louisville (KY) by J. Stoddard Johnston (1833-1913), chapter 19 constitutes a 12-page mini-history of bourbon in Kentucky. It is an informative documentary source, on numerous areas: the original grain bills used; origins of the industry; the different types of bourbon manufacture; its economic importance and taxation/bonding; significance and origins of aging; onset of neutral spirits; and the sociological aspects of whiskey. In effect the article is a bird’s-eye view of the industry from the perch of the gaslight era. Of the many impressions the account leaves even on an old hand at bourbon history, not least is the confident and entirely justified assertion of bourbon’s national and indeed international reputation by 1896. This is all the more astonishing since the first recorded advertisement for bourbon appeared in the 1820s and it was only on the eve of the Civil War that bourbon had a notable impact beyond Kentucky. This was due in particular due to the success of Old Crow, the “red crettur” whiskey developed by Scottish immigrant Dr. James Crow. 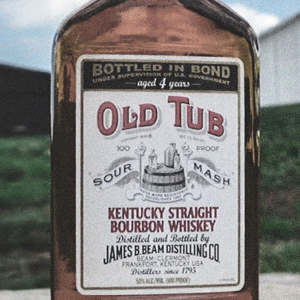 His pioneering work in the second quarter of the century on sour mashing and aging helped bourbon become what it is today. Even given Crow’s vital work, Johnston’s whiskey chapter notes that only after the Civil War did producers methodically age bourbon. This arose in good part due to the influence of the bonding laws which delayed payment of excise on whiskey until it was sold to the public. Slack periods resulted in whisky staying in bond longer than planned and showed distillers how additional aging improved the product. Thus, it was only after 1864 that bourbon, a regional drink with pockets of influence, really had a chance to make its mark on the nation. This came through the settlement of the west, economic expansion after the Civil War despite the periodic busts, and probably Mark Twain; he liked bourbon and wrote about it in his books. But 1865-1896 is a mere 30 years! In 30 years something originally local had become an institution, a thing in our parlance – not that it wasn’t in the gunsights of the temperance campaigners, but that is another story. And, whether sweet mash or sour and no matter (I would add) how distilled, all these types were viewed in the market as “bourbon” (see E.H. Taylor’s quoted remarks), a high-quality product on a par with the whiskeys of Great Britain and Ireland. In this fame must be included Pennsylvania and Maryland, as they specialized in the straight rye whiskey which preceded the corn-based form that became bourbon. It’s hard to think today of a similar product which achieved acclaim and high professional respect in such a short time. Perhaps Ontario ice wine is an example. Sierra Nevada Pale Ale is another, and Ken Grossman is surely the E.H. Taylor of his industry today, but that is also another story. Johnston’s chapter on whisky, actually authored by Thomas Gilmore, a contributor to the book, quoted from or interviewed the said Edmund Haynes Taylor, banker, distiller, politician and one of the founders of the bourbon industry. Also quoted at length was a Yale-educated chemist who probably worked for one of Taylor’s distilleries. In Taylor’s detailed description of small-tub whiskey-making, he specifically states the mash was fermented spontaneously, with no yeast added (“The fermentation is spontaneous and unforced…”). He noted that this produced a less “attenuated” (thorough) reduction of the grain sugars – thus was less efficient than adding yeast but resulted in a superior product. Taylor also was a proponent of double pot-distillation. He noted that sour mash whiskey of this type needed long aging, he said eight to ten years at a minimum. His distilleries did not (then) use column stills even though they can be adapted to produce a “heavy” spirit by restricting distilling-out proof to under 160 (80% abv). Thus, small-tub mashing used backset as sole fermenting agent in the 1800s. While various American whisky-making directions have been published since the early 1800s, some for sweet mash, some for sour, it has not generally been accepted, I believe, that backset can truly take the place of yeast. Given however the analogy to dunder I made yesterday and the plain statements in older (and there are newer) chemical texts that dunder is an innoculum, and given too Taylor’s specific comment quoted by Johnston’s book that whiskey fermentation using backset is spontaneous, there can be no doubt that backset alone caused a sufficient fermentation in bourbon-making in the 1800s. Of course, yeast could still be added and probably was for stuck fermentations or in some distilleries. In fact, Gilmore gives a list of production techniques which are a “mix and match” set of various elements: where only water is used to mix the mash, where backset is used, where yeast is added from a previous ferment or freshly, where the newer column stills were used to produce the distillate, and so on. Many variations existed, most of which have died out over time. Today, the large distillers at any rate only use column distillation-plus-doubling except for Woodford Reserve with its triple pot still system, and all add yeast to cause a fermentation. All use some backset in the process. Note re image above: The image above was sourced from this site of Jim Beam Bourbon. It is believed available for educational and historical purposes. All feedback welcomed.